Khusrau Mirza-the favourite grandson of Emperor Akbar, but blinded by his father Jahangir and subsequently killed by the command of his own brother Shah Jahan! He was yet again a victim of Mughal court politics, struggle for power and throne, which made brothers thirst for the blood of their own brother. But Kusrau Mirza was unfortunate enough to have his own father-Jahangir thirst for his blood, as he saw him as an adversary and a thorn on his path to the Mughal throne, after Akbar. As if this was not enough, his own Brother Shah Jahan aka Khurram eventually had him liquidated. Khusrau Mirza (b. Aug 16, 1587) was the first born and eldest son of Jahangir aka Prince Salim and Princess Manbhawati Bai aka Shah Begum, daughter of Bhagwan Das of Amber. 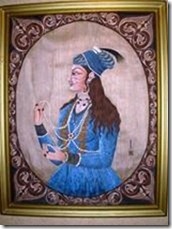 His maternal uncle was Raja Man Singh, the nephew of “Mariam uz-Zamani Begum Sahiba aka Rukmavati Sahiba aka Rajkumari Hira Kunwari akaHarkha Bai-wife of Akbar. Khusrau Mirza was married to the daughter of Khan-i-Khana Rahim. 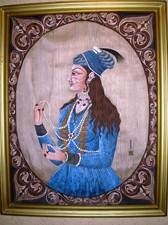 She was his chief wife and mother of Khusrau Mirza’s eldest son-called Dilawar Khan and his second son-Buland Akhtar (who died at young age). Khusrau had another son Gurshasp by an unnamed mother. By the daughter of Muqim who was the son of Mihtar Fazil Rikab-dar, he had his youngest son, Rastekar. It is believed that Khusrau was good natured, well-mannered and had great administrative and military skills. These qualities made him extremely popular among the citizens for his and also the nobles. Khusaru was a capable prince but was surrounded by highly ambitious and deceitful family members like Nur Jahan, Khurram his brother, Jehangir his father.Khusrau had wanted to become an emperor because he was always told he would be a better emperor and was popular among the masses. But his unbecoming were his repetitive errors. He rebelled several times yet again ad again unsuccessfully and even attempted a few assassination attempts on Jahangir. This landed him under house arrest. Jehangir was powerful as an emperor, he had a huge army at his disposal whereas, Khusrau was not good at political manoeuvres. Hence, he lost the succession war and his eyesight to his father Jehangir and also finally his life to Shah Jahan-his brother. His mother, Manbhawati Bai, had committed suicide in May 1605 by an overdose of opium amid the turmoil in the family and being caught between father and son, wherein the father was against son and brother was thirsting for blood of his own brother. 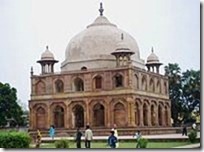 Her Tomb is in Khusrau Bagh in Allahabad. She lies there, amidst the tomb of her son Khusrau and her daughter Nithar Begum. 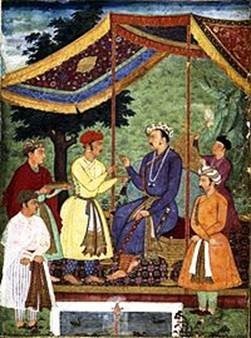 Akbar – Khusrau’s grandfather had lost hopes on his Son Salim aka Jahangir, who by the time of his father’s death had turned into an addict of stimulants like arrack and opium, and was given to capricious mood swings. In addition, between 1600 and 1605 he also led a series of revolts against Akbar. 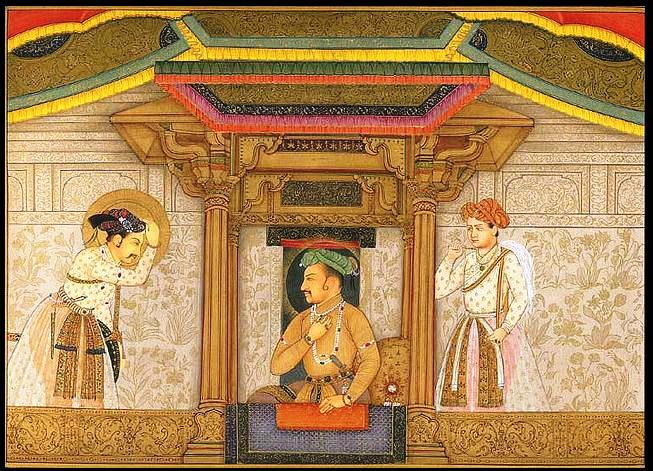 This war war between father and son was averted only through the intervention of Akbar’s senior begums and also by that time Salim had realised that he was militarily no match for his father. Akbar was worried over the succession of the Mughal throne. He was disappointed in his son Salim. He laid gleaming hopes on Khusrau. His hopes were seconded by wide spread consent of nobles and populace. Khusrau had all the requisite qualities to succeed him and soon grew up to be a court favourite. Edward Terry, a clergyman at the Mughal court writes of him: “He had a pleasing presence and excellent carriage, was exceedingly beloved of the common people, their love and delight”. Akbar on his deathbed had placed the robes and turban of kingship in the hands of Khusrou Mirza in a formal gesture making his preference clear. 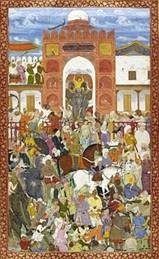 After Akbars death there was a bitter battle for throne between Salim aka Aurangzeb and Khusrou. Salim was backed by Akbar’s senior wives who wielded considerable power behind the scenes; Khusrau by the duo of Man Singh, the Raja of Amber, and Aziz Khan Koka (Khusrau’s uncle and father-in-law respectively). Khusau had felt that his fate was in ascent. He was convinced that he was destined to be the next ruler of Hindustan and had begun addressing his own father Salim in terms of equality as ‘Bhai’ or brother rather than as a father. But this was not to be and as soon as Akbar had breathed his last, there were rapid political upheavals. Jahangir and many nobles were alienated against Khusrau because when Jehangir went to Agra fort to meet his ailing father – Akbar, a courtier warned him of a plot to assassinate him by Khusrau’s men. Persian nobels and other religious leaders who were already were anxious owing to Akbar’s favouritism for Khusrou, and had then commented cheek in tongue that how can a grandchild ascend the throne when the son was still alive. Jehangir’s step mothers Ruqaiah and Salima begum, the timurid princess too supported him only and Akbar was told that as per timurid traditions he cannot make a son Khusrau as emperor when father Jehangir was alive. Akbar finally crowned Jehangir as the future emperor. A meeting of senior umra, was held immediately, to decide the succession. Persian nobles were apprehensive that if Khusrau became emperor, the Rajput influence would strengthen weakening the Persian and Ulema’s influence. 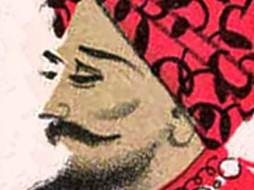 They started secretly conspiring to make Jehangir the emperor on the promise that he will follow an orthodox islamic way of court dealings rather than the liberal ones of his father Emperor Akbar. Jehangir in order to win the nobles support agreed. Besides, since Akbar too had relented towards the end and handed the robes of kingship to Salim, tipped the scales in favour of the Salim. 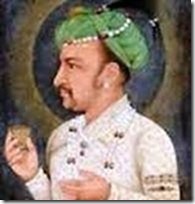 Finally, On November 2, 1605, Salim ascended the Mughal throne as Nuruddin Mohammed Jahangir Padshah Ghazi. Jehangir was crowned emperor after Akbar’s death in 1605. One of the first acts of the new Emperor was to have Prince Khusrau confined to his quarters in the fort, with only his wife to keep him company. Khusaru Mirza and his wife , the daughter of Aziz Khan Koka were placed under house arrest in Agra fort by Jehangir. Historians at Jehangir’s court have recorded Khusrau’s deep plunge into melancholy. They have even attributed it to deficiencies in character inherited from his mother’s side. But in reality, it was a natural reaction for a young prince who had all along been offered a giddy vision of power, ascent to the Mughal throne, an opportunity given to very few. He had been encouraged by many, including his illustrious grandfather-Akbar, to believe in his manifest destiny, but his fate crushed his dreams and destiny in just a few hours. Khusrau was frustrated and on the pretext of going to visit his grandfather’s grave at Sikandra left with a few hundred of his army men. He fled to Lahore fort where he laid siege. 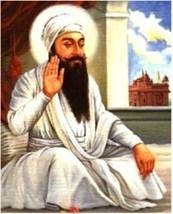 On the way Sikh Guru Arjan Dev blessed him for which he paid a heavy price with his life. Jehangir was swift and defeated his forced and captured him. All his forces were impaled alive on stakes and Khusrau was forced to see their pain. An extremely disappointed Khusrau was advised by a wide network of informants and sympathisers, and he made his move on April 15, 1606. During a visit to the tomb of his grandfather Akbar at Sikandra near Delhi, he slipped past his guards and, with a small band of soldiers faithful to him and the armies of Hussain Beg and Khan e Khana Rahim, me moved towards Lahore. The news of Khusrau’s flight sped through the country like wildfire and unforeseen by Khusrau, Jahangir acted with speed and decision. 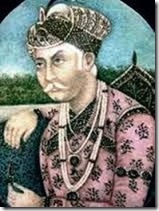 The newly appointed governor, Dilawar Khan, raced from Agra to Lahore in just 11 days and strengthened and sealed the defences before Khusrau’s army could reach the city. Simultaneously, a punitive force of over 50,000 was assembled at Agra and launched towards the enemy. Unable to break Lahore’s defences, Khusrau had no option but to turn and fight. The armies of Khusrau and Jahangir clashed on the north bank of the Ravi on April 27, 1606. But the rebels were defeated and Khusrau was captured and brought before his father in chains. Jahangir’s retribution was ruthless. The rebel soldiers and their commanders were impaled alive on stakes by the hundreds, and Khusrau was forced to ride between the screaming men, to witness their agony up close. Sikh Guru, Arjan Dev who had blessed Khusrau on his way to Lahore was summarily executed. Resulting in scarring of the Sikh psyche, that would reverberate for centuries. Khusrau’s life was spared, but he was condemned to a terrible fate. Either immediately after the rebellion or a year later, holding him complicit in a further plot against him, Jahangir ordered Khusrau blinded. Khusrau was still popular, and several voices at court, including those of Jahangir loyalists, pleaded for him to be spared. But the Emperor was adamant and in one contemporary account, the act was done by wire inserted into his eyes, causing a pain “beyond all expression”. He was then thrown into a dungeon. Through it all, the victim bore himself stoically, uttering not a word of protest or pain. This made local citizens admire him more for his courage under immense pain. Hence a much-loved prince of Hindustan was wronged and condemned by the game of power to spend the remainder of his life in darkness and obscurity. Soon after the blinding of Khusrau, Jahangir most probably in a fit of remorse, repented and ordered his physicians to try and restore his son’s vision. With their efforts, Khusrau was spared the horror of total blindness and a thin haze of light penetrated his eyes, such that he could see just shadows when people moved, as ghost images across a screen. It is chronicled that whenever the Mughal Emperor travelled out of Agra, the royal convoy would almost always have Khusrau in its wake, shuffling along in leg chains. Once when Jahangir embarked on a long hunting trip, he had Khusrau walled up in a tower. Khusrau had found respite in his wife, the daughter of Aziz Khan Koka. In the years that followed, through all their trials and tribulations, husband and wife remained passionately devoted to each other. Though Jahangir had designed no bondages for her and made it clear that she was free to do as she pleased, she refused to leave Khusrau, instead tending to him lovingly, and remaining by his side even when he was walled up in the tower. Khusraus ordeal knew no end. In 1616, when Jahangir had been now on the throne for 11 years. Apart from Khusrau, he had sired three sons, two of whom, were Pervez and Shahriyar. The last, Khurram, was a brilliant general with exceptional military and administrative gifts. In 1615, he had covered himself with glory by subjugating Mewar, which had been a thorn in Mughal flesh for decades, and his claim to succeed an ageing Jahangir seemed clear. 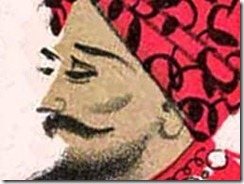 However, by this time the Jahangir was only a figurehead. Real authority had long since passed, with his consent, to Empress Nur-Jahan. She saw the rise of Prince Khurram as a threat to her dominance. Noor Jahan in her efforts to put down Khurram, had approached Khusrau for the hand of Ladli Begum, her daughter by her first husband. The adventurer Pietro Della Valle has left a fascinating account of what followed. “First Nur-Jahan informed Khusrau of that which he knew already: that Khurram had demanded the custody of Khusrau from Jahangir. Khurram claimed that he feared another plot against Jahangir by his half-brother. This fooled no one, for by now it was patently clear that Khusrau was incapable of mounting anything like a conspiracy. Khurram was simply taking steps to remove all rivals in his path”. But Khusrau still commanded many loyalties. The same begums who had supported Jahangir against Khusrau earlier now worked hard for his safety, and, as a compromise measure, Khusrau’s custody had been given to Nur-Jahan’s brother, Asaf Khan. The condition was if only Khusrau would consent to marry her daughter-Ladli Begum, Nur-Jahan had promised him not only his freedom but also that she would support him in the succession of the Mughal throme once again. But Khusrau refused. He was faithful and loyal to his wife, who was the one person who had stood by his side through all the years and he would have nothing whatever to do with another woman. The options were plainly laid out starkly before the prince: the throne, or at the very least freedom and luxury versus certain death. His wife, according to Della Valle, begged him on bended knee to accede to Nur-Jahan’s plan and save himself, but Khusrau “could never be prevailed with”. Throughout 1616–17, Nur-Jahan and Asaf Khan tried to convince Khusrau, but he remained steadfast in his refusal to contemplate another woman. Finally they gave up and turned instead to the pliable Shahriyar. Khusrau’s usefulness to the Empress Noorjahan was over, and now she made no further effort to stall his transfer to Khurram’s custody. Khusrau had effectively signed his own death warrant. In 1617, he was given over to Khurram (known now by the honorific Shah Jahan) who had him quickly moved to Burhanpur in the Deccan. Khusrau was now a man on borrowed time. The end came in January 1622. It is said that a slave of Shah Jahan’s named Raza Bahadur sought to enter Khusrau’s chambers in the middle of the night. When Khusrau refused him entry, Raza Bahadur broke open the door and rushed in with some accomplices and fell upon Khusrau. Khusrau shouted out to wake his servants and, despite his partial blindness, defended himself bravely but to no avail. He was strangled and then re-arranged on his bed to make it appear as if his death was natural. Early next day, his wife was the first to discover him. Her shrieks soon wakened the palace. On January 29, Jahangir received word from Shah Jahan that Khusrau had died of qalanj, colic pains. But, as word of Khusrau’s death swept across the empire, there was a public outpouring of grief as had not been seen for a long time. On the Emperor’s orders, Khusrau’s body was exhumed from his makeshift grave, sent to Allahabad and consigned in a mausoleum next to his mother’s in a garden, now called Khusrau Bagh. A movement soon came into being that proclaimed Khusrau a martyred saint and shrines sprang up wherever his body had rested on its way to Allahabad. So popular were these shrines that a contemporary Dutch observer wrote that “both Hindus and Moslems went there in vast numbers in procession each Thursday … to his worship”. Until, that is, Jahangir ordered them destroyed and the worshippers driven away. Neither life nor death has not been kind to this unfortunate prince. Khusrau may have been pushed to the back pages of history compared to his brother Shah Jahan but times will stand testimony to a prince who was wronged by his own father and brother. This entry was posted in Historical Accounts and tagged Akbar, Asaf Khan, Jahangir, Khusrau Mirza, Noor Jahan, Shah Jahan. Bookmark the permalink.